Marius don Hellespont and his apprentice, Gerd, are professional looters of battlefields. When they stumble upon the corpse of the King of Scorby and Gerd is killed, Marius is mistaken for the monarch by one of the dead soldiers and is transported down to the Kingdom of the Dead. Just like the living citizens, the dead need a King — after all, the King is God’s representative, and someone needs to remind God where they are. And so it comes to pass that Marius is banished to the surface with one message: if he wants to recover his life he must find the dead a King. Which he fully intends to do. Just as soon as he stops running away. Marius de Hellespont is a liar, cheat, thief and witty charmer. A little like Jack Sparrow, he seems to always land on his feet no matter what ridiculous situation he ends up in. And trust me, he ends up in a number of bizarre and unexpected circumstances, and usually on the wrong end of the law or moral compass. Particularly because he is now dead. Marius' initial response to his situation and duty to find a new king was to run away, and it makes him seem as cowardly and pathetic as you would expect a looter of the dead to be. Whilst his character developed and grew throughout the book, making Marius a just-about likable character, his daring, cunning and unreprehensible behaviour really made the story. At first the writing tended towards the over descriptive, which sometimes slowed the plot down with its tangential diversions. But further into the book, the plot, dialogue and wit improved by bounds and had me chuckling away. In fact the story reminded me a little of the madcap adventures that befall Voltaire’s character Candide in his book of the same name. Both plots have a philosophical bent to them and involve a series of rather absurd adventures and mishaps. Although some of the secondary characters could have benefitted from a little more fleshing out to avoid them feeling one dimensional, my favourite character was King Nandus, who had a slightly strange (and possibly inappropriate) affection for horses. Found in the underwater wreck of his groundbreaking ship, the skeletal form of Nandus unfortunately takes on a few too many horse-like qualities, which made the story both humorous and endearing. The fact that the poor man didn't even realise the truth of his situation made it all the more pitiful and comical. Despite the darker themes of death, deception and looting, overall the story had an underlying moral and spiritual emphasis, as Marius very slowly started to see the error of his ways. I loved the rather maccabre idea of the dead needing a king to rule their deathly kingdom, and being able to extend their deathly grip into the mortal realm to get Marius and Gerd to find them a ruler. What on earth would their job be as a King of the Dead? 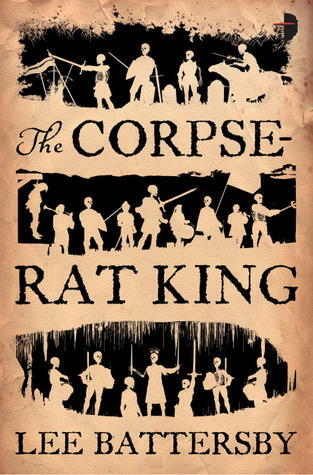 The Corpse-Rat King is an absurd and fantastical tale of a man about to learn the error of his ways the hard way.